Why being part of the GRC Family is the best! We offer the chance to be part of an amazing family, training and performing together; we offer teams and programs for all ages from the recreational athlete to truly committed cheerleader! 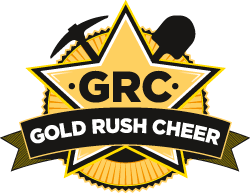 Gold Rush Cheer is the only 100% full committed program to All Star Cheerleading in the Goldfields region. For our 2018 season we have some NEW fantastic equipment, including a full size SPRUNG competition floor. We also have lots of other equipment to help our cheerleaders progress such as our 12 metre air track. Gold Rush Cheer is lead by experienced and trained coaches who all have their required USASF credentials and working with children’s checks. Gold Rush Cheer is passionate about EVERY athlete within our program. We want to help every athlete achieve their goals and enjoy every minute of their journey. Gold Rush Cheer offers our athletes travelling opportunities to showcase their cheerleading talents outside of the Goldfields region and on the big stage! At Gold Rush Cheer our coaching staff are passionate and enthusiastic about every aspect of cheerleading, we love to involve everyone in the fun including extended family and friends. We also run a CIT ‘Coach in Training’ Program that offers the chance to train as a coach. This is offered to athletes showing the ability to lead as well as training hard and having the correct skill set needed to coach others. This process starts by helping and supporting current coaches to follow through to gaining their own credentials. Athletes in this program can start as young as 15 years old being offered to motivated, responsible, inspiring individuals.